FaceCake's augmented retail platform presents consumers with interactive access to relevant information in an easy-to-use format to quickly find what they’re looking for. FaceCake’s platform for apparel, cosmetics, jewelry, accessories and more enables shoppers to Try-On products, compare looks, get style advice and ultimately make informed choices, all in real time. With FaceCake’s shopping platform’s integrated social sharing component, taking selfies, sharing looks and getting input from friends is a snap. FaceCake’s augmented retail shopping platform provides frictionless product interaction and built-in links that make it easy to purchase favorites. CAKE is the first in-browser augmented reality shopping platform that works with a webcam and any browser, letting online shoppers view products in an augmented reality environment directly from the product detail page without leaving the e-commerce site they are on. Instantly engaging and requiring no download, plug-ins, extensions or user input, shoppers interact with products, viewing shades live on their own image as an alternate personalized product view. CAKE is easy for brand partners, who only have to copy a small code snippet in order to have this augmented reality shopping platform integrated into their site. 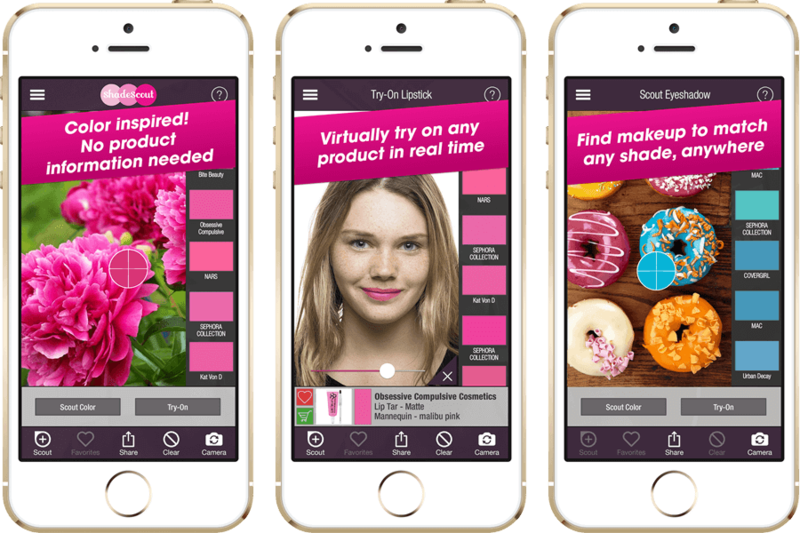 FaceCake’s visual search and augmented reality mobile beauty app instantly finds makeup that matches any color, anywhere, providing direct product matches that users can virtually Try-On in real time using their mobile device as a mirror. Social sharing and purchase options are built in, so users can find, try, share and buy from wherever they are. With over 100 participating popular and luxury brands, ShadeScout is a universal cosmetics counter in the palm of your hand. ShadeScout and companion nail polish app, ShadeScout Nails, are both free on the App Store. 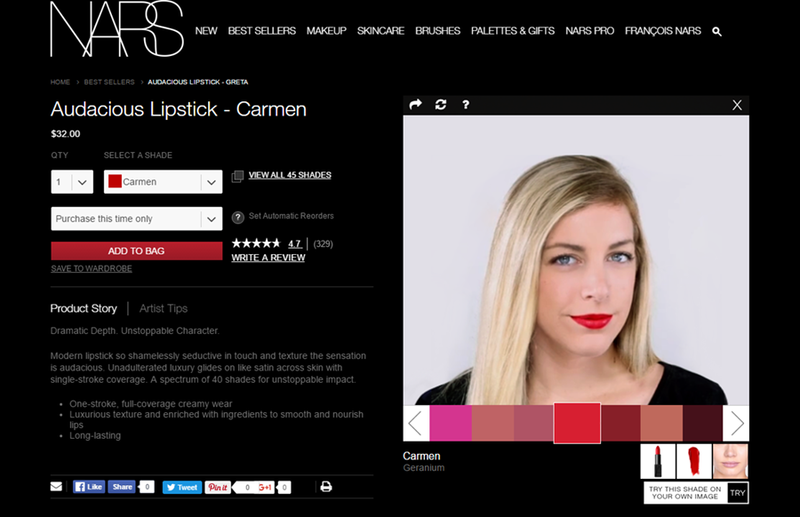 Available both online and in-store, Swivel Close-Up's strong set of fully-customizable features revolutionizes the traditional shopping experience, giving consumers the ability to visualize themselves wearing cosmetics, jewelry, eyewear and accessories in realtime. Swivel Close-Up is easy to use, transforming shopping into an event that encourages social sharing and builds purchasing confidence. And with its dynamic data tracking and share features, Swivel Close-Up positions brands to be smarter, social businesses at the forefront of the swiftly changing landscape of fashion and beauty. Swivel, a cornerstone of FaceCake’s suite of marketing technologies enables brands to connect with and engage consumers with superior personalization, contains a social media component that incorporates an effortless referral strategy to build greater brand awareness, and boasts advanced user and data capabilities to provide a seamless, tailored experience that places your business at the forefront of NextGen shopping. Designed to capture shopper attention and keep it, our displays transmit dynamic content in an interactive format that extends engagement time through virtual Try-On, touch, mobile compatibility and more, automatically applying featured products in real time to anyone who walks within camera view. Immersive visual elements elevate the Try-On experience by complementing featured products and integrated social shopping features allow users to share the fun with family and friends. The rich portfolio of options such as live side-by-side compare view, a customizable data structure and built-in purchase features make Swivel Smart Digital Signage a powerful marketing and sales tool. “Three Apps That Will Help You Find The Perfect Makeup"
Beauty Apps Are Selling Us Instant Makeovers — But Is Anyone Buying the Actual Makeup? Can an App Give You a Makeover From Head to Toe? FaceCake Marketing Technologies, Inc. is a leader in augmented retail with a personalized, cross-device, targeted marketing platform. Combining patented technologies with intuitive user interfaces, FaceCake's innovations in Try-On allow consumers to virtually try individual or multiple products on their own images in real time, while instantly providing relevant product recommendations within each user session for superior personalization. With billions of product Try-Ons, FaceCake is expert at eliminating traditional shopping barriers and delivering immersive engagement that carries customers through decision points. In-store and at-home solutions are also compatible across devices, including an in-store kiosk, desktop, tablet or mobile phone, making FaceCake’s shopping platform accessible from anywhere. © 2018 FaceCake Marketing Technologies, Inc. All Rights Reserved.